I don't have much to say here. Arsenal are through to the Round of 32 with a victory here on matchday four, with a possible two games to spare. Plus, they have a 100% record at home this season to maintain. Might as well get on with the job. There are doubts over Sead Kolašinac, who injured his hip against Swansea at the weekend; he'll be tested before Sunday's trip to Manchester City and is expected to be rested here. There are no returns on the cards for any of Arsenal's injured players, including David Ospina, who was expected back from his groin problem. We won't see Danny Welbeck and Shkodran Mustafi until after the upcoming international break. Calum Chambers is, however, back in full training. As has been the case with the previous Europa League matches, and with this one coming at home, you should expect to see a lot of rotation in the XI. On the other hand, without Ospina available, Petr Čech started in Belgrade on matchday three and might be required here to give Arsenal the best shot at qualification with games to spare. You can start Matt Macey all you want in dead rubber. Predicted XI: Čech, Debuchy, Holding, Elneny, Nelson, Maitland-Niles, Coquelin, Willock, Wilshere, Walcott, Giroud. Milan Rodić will serve a one-match ban after he was sent off against Arsenal on matchday three. My sources suggest that Ricardo Cavalcante and Branko Jovicić are both out injured for the Serbian side, but those sources were wrong the last time, so unless I go ahead and learn Serbian to find more accurate team news, your guess is as good as mine. Predicted XI: Borjan, Stojković, Savić, Le Tallec, Gobeljić, Srnić, Kanga, Donald (ić? ), Krstičić, Radonjić, Boakye. Arsenal have lost once in their last 12 matches, across all competitions, since losing 4-0 at Liverpool on August 27. Their only blips have been the 0-0 draw at Chelsea, the 2-1 loss at Watford, and I guess you could add needing extra time to beat Norwich in the League Cup. Arsenal have won eight of their last nine and have won four straight for the second time this season. They have won all of their home games; you'd have to go back to their 2-2 draw with Manchester City on April 2 for the last time they dropped points at home. The last team to win at the Emirates was Bayern Munich, on March 7, by a red-card aided 5-1 scoreline. 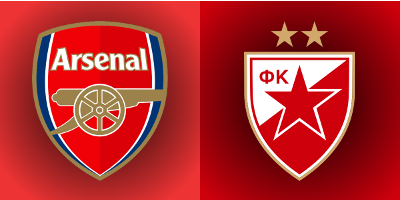 Red Star Belgrade have won five of their last six themselves, though that loss came against Arsenal in the reverse fixture. Their last league setback was on October 1 against Napredak Kruševac. Red Star are four points clear at the top of the Serbian table, ahead of their Belgrade rival Partizan. Not much to say here that wasn't said in the last preview. Arsenal won the reverse fixture on matchday 3, 1-0 in Belgrade, when Olivier Giroud scored an audacious bicycle kick in the 85th minute. It was Arsenal's first win in three tries against Red Star Belgrade, having lost 1-0 in Belgrade and drawn 1-1 at Highbury in the 1978/79 UEFA Cup. Arsenal's only other matches against Serbian competition came in the 2010 Champions League group stage, when they beat Partizan twice by 3-1 scorelines. Red Star Belgrade have six wins, six losses, and five draws all-time against English sides. They have only won once in seven tries on English soil. That was in Liverpool in 1973, 2-1, in the second round of the European Cup, to win the tie 4-2 on aggregate. They went on to lose to Atlético Madrid in the next round, who themselves lost the final to Bayern Munich. The match officials are from Italy; the referee is Luca Banti. As has been the case in other Europa League matches, Arsenal have never seen this referee before, since Arsenal have not played at this level in Europe in almost two decades. Banti has worked two previous Belgrade matches. In the 2013 second qualifying round of the Europa League, Banti worked a 2-0 Red Star win, in Belgrade, over Icelandic side Íþróttabandalag Vestmannaeyja. Okay, some of those aren't even letters. They went on to lose to Ukrainian side Chornomorets Odesa in the next round. Last year, Banti took charge of a Champions League qualifying match between Red Star and Ludogorets, which the Bulgarian side won 4-2 in Serbia. Of course, you likely know how that tie ended, since Ludogorets were in Arsenal's group. John Painting is a contributing writer to the Modern Gooner and is finishing this preview at the eleventh hour. You can follow him on Twitter @zorrocat to tell him that you know it was really the tenth hour and he is just exaggerating slightly.